I took the long way home to get here, to be a commerical photographer, that is. I thought I was going to be a high school teacher when I graduated from college. I tried a lot of different things; substitute teaching, social work, and then I ended up back in school, a graduate student at large at Northern Illinois University. I studied photography there with Larry Gregory and Doug Stewart. When I finished that, I went out to see if I could get any work. There wasn't much at first, and I freelanced any commerical photography I could get. I substitute taught on the days I didn't have an assignment, which back then was a lot of the days. Gradually, after a few years it got better, and I stopped the substitute teaching, and did commercial photography full time. 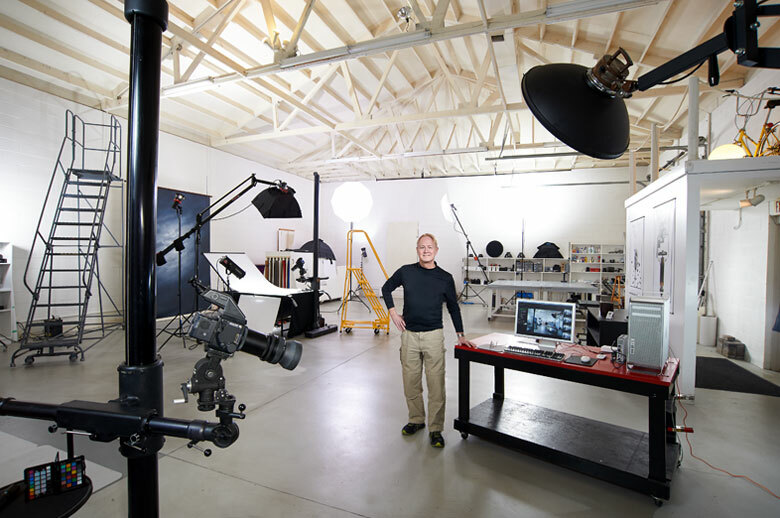 I built a studio in 1994: it has an overhead door, thick concrete floors, 3,000 square feet, it's big enough to shoot a truck, which I sometimes do. What else can I say? I remember once back at Northern, my instructors used to tell me that no one has ever taken the perfect photograph, but that didn't mean you shouldn't try. In retrospect, I think that was good advice, and still pretty much sums up my approach to every assignment. I think maybe I've gotten close a few times, and I have put a few of those images on this Web site. If you like what you see, I would be glad to show you more. Just give me a call, I'm always happy to discuss any photographic projects you might have.